In an early morning vote Tuesday, the state Legislature's budget committee voted to approve several wide-ranging plans that would restrict early voting and limit the power of Democratic Gov.-elect Tony Evers and Attorney General-elect Josh Kaul. The vote came at 12:08 a.m., after more than 10 hours of testimony and debate at the state Capitol. The measures passed on party line votes, with the state budget committee's 12 Republican members voting in favor and four Democrats voting against. As the hearing began, Republican lawmakers were met with chants of "shame" and "protect our vote" from crowds gathered in Capitol hallways. Members of the public gathered inside the hearing room periodically booed as lawmakers debated the measures. Dozens of members of the public testified against the proposals during the public hearing, including Tammy Wood of La Valle. "This is nothing less than an utter show of disdain for the citizens of Wisconsin," Wood said. "We do not consent to you knee-capping our governor, we do not consent to you stacking our courts, we do not consent to you stacking our elections, we do not consent to be being divided, we do not consent to be conquered." 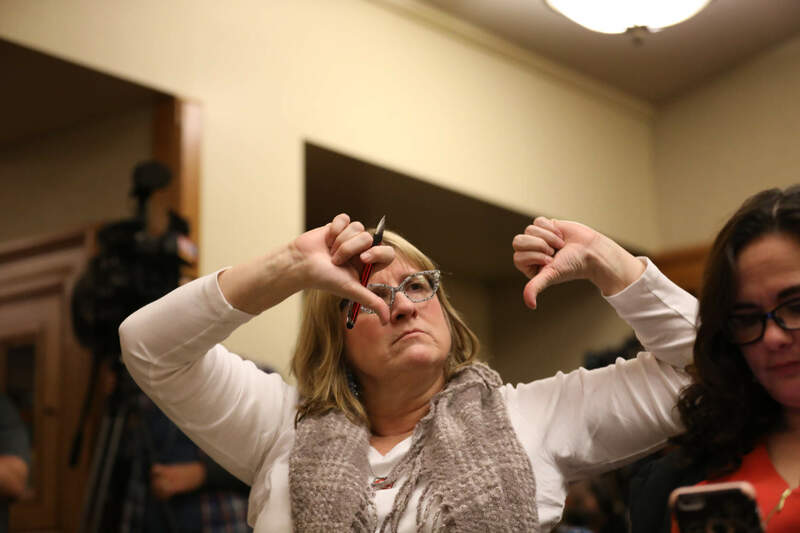 Bonnie Margulis of Madison said the proposals ignore the views of Wisconsin voters, who voted to elect Evers and Kaul. "Their policies were clear and known, and voters voted for them because of those policies," Margulis said. "Listen to our voices, listen to our votes." Republican lawmakers pushed back on the criticisms, saying they are aimed at balancing the power of the Legislature and the executive branch. 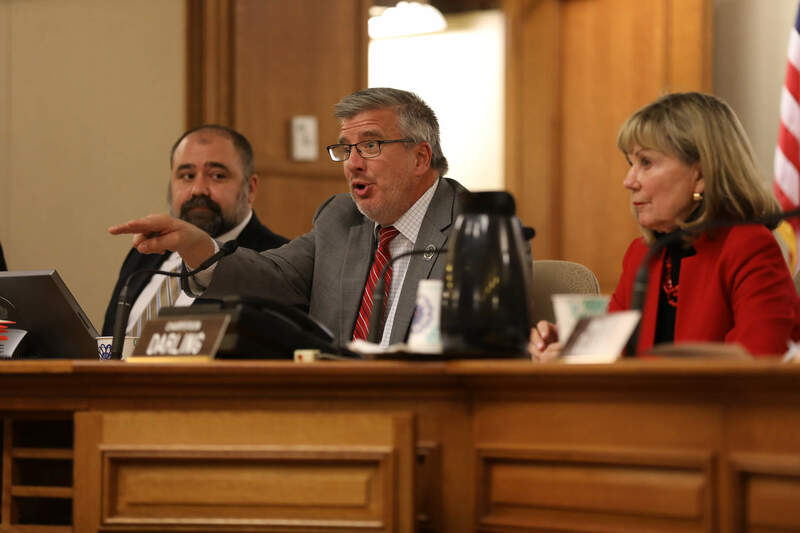 "Let's not exaggerate what we're really doing here today," said Rep. John Nygren, R-Marinette, co-chair of the budget committee. "This is a balancing of power in the state of Wisconsin." Nygren said the changes will allow lawmakers to work more effectively with Evers. "We realize that we are setting a precedent here and making changes that will effect future Republican governors as well," he said. The proposals now move to consideration before the full state Legislature. That is scheduled to take place Tuesday afternoon. The plans were introduced for the first time late Friday afternoon. Most of the focus since that time has been on the election law changes, including a plan to move the date of the 2020 presidential primary from April to March. The bill including that proposal did not pass the budget committee Tuesday morning, so it is likely dead. When asked last week about the "upside" of moving Wisconsin's presidential primary, Senate Majority Leader Scott Fitzgerald, R-Juneau, acknowledged it could give conservative state Supreme Court Justice Daniel Kelly a better chance of winning. On Monday, staff at the Wisconsin Elections Commission estimated moving Wisconsin's presidential primary from April to March would cost up to $6.8 million. Members of the commission, who are appointed by an even split of Democrats and Republicans, also voted 6-0 for a motion warning lawmakers of what they saw as the plan's pitfalls. "Under (Assembly bill) 1071 as drafted, it would be extraordinarily difficult to accomplish an additional election date given existing statutory framework," read the unanimous motion. "We are aware of multiple conflicts not resolved with this legislation and are concerned that completion of mandatory tasks may not be feasible." Clerks, who run elections, have warned the plan would create logistical headaches by creating overlapping timelines and voter confusion. "Obviously, we consider it a waste of money and resources, but more fundamentally, we don't think we can do it," said Dane County Clerk Scott McDonnell. "I think there's a suggestion that we can buy our way out of this. We can't." On Monday, a lawyer for the liberal One Wisconsin Institute warned against the provision of the bill that restricts early voting, saying it would be challenged in court. One Wisconsin Institute successfully sued to overturn earlier restrictions on early voting in a decision handed down in 2016 by U.S. District Judge James Peterson. "That would directly conflict with the injunction that Judge Peterson put in place for those reasons," said One Wisconsin Institute lawyer Bruce Spiva. The proposed early voting changes would trim the number of days in-person absentee voting is allowed in Wisconsin by about five days. If the measure passes, early voting would last roughly two weeks before Election Day. During the public hearing on the measure, Nygren defended the proposed change. Nygren pointed out many rural communities in Wisconsin have fewer opportunities for early voting than urban parts of the state, including Madison and Milwaukee. "It's a fairness issue," Nygren said. But Democrats on the committee pushed back on that, saying resources should be increased for rural communities so they may offer the same early voting hours as urban areas, if that is a concern. They also argued communities with larger populations should be able to offer more early voting opportunities, for logistical reasons. Rep. Katrina Shankland, D-Stevens Point, called the proposal to cut early voting in urban areas an abuse of power. "You guys are just going crazy here," Shankland said. "This is like 'Gremlins' after midnight." While the election law changes have generated the most attention, other changes proposed by Republicans would significantly scale back the power of the Democrats who won statewide office last month. 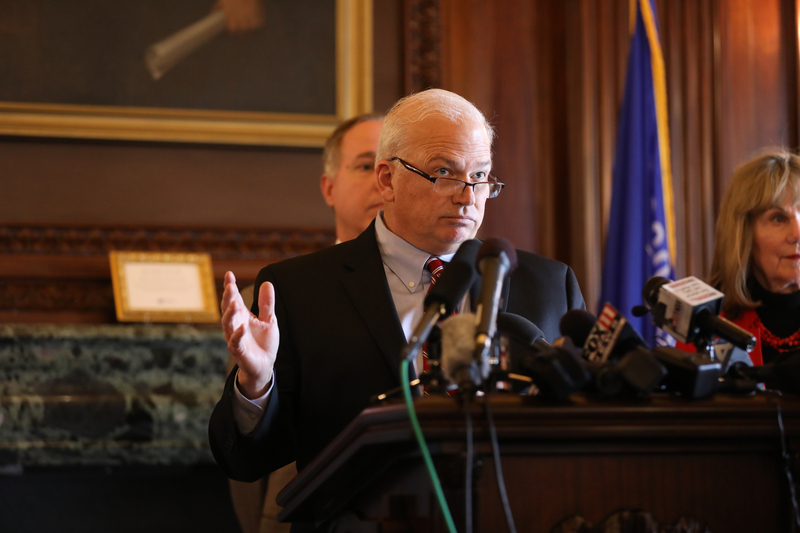 Speaking to reporters Monday, Fitzgerald made clear that many of the plans included in the extraordinary session package were aimed at making it harder for Evers to accomplish his goals. "Listen, I'm concerned. I think that Gov.-elect Evers is going to bring a liberal agenda to Wisconsin," Fitzgerald said at a press conference before the start of the committee meeting. "I don't have any problem highlighting that right now. I want people to understand that. That there's going to be a divide between the legislative and executive branch." In a written statement submitted to the committee, Evers said Wisconsin voters "expect more from our government than what is happening." "The legislation before you today and the spirit of this extraordinary session are unfettered attempts to override and ignore what the people of Wisconsin asked for this November," Evers said. "This is rancor and politics as usual." One provision approved Tuesday by the committee could prevent Evers and Kaul from fulfilling their campaign promise to end Wisconsin's participation in a multi-state lawsuit to overturn the Affordable Care Act. Under current law, Kaul could do so with Evers' approval. Under the proposal slated for the extraordinary session, approval to withdraw from such a multi-state lawsuit would have to come from the state budget committee, rather than the governor. Republicans hold a 12-4 majority on that committee, making it unlikely they would approve such a move. Another provision that moved forward would give majority Republicans substantially more control over the Wisconsin Economic Development Corp. Right now, gubernatorial appointments make up a majority of the WEDC board, and the governor gets to appoint the agency's CEO. The plans under consideration in the lame duck session would give Republican lawmakers a majority of board appointments and the board would pick the CEO. The proposals would also dramatically scale back Evers' control of the rulemaking process, and concentrate more power in the hands of the Legislature. Evers would also lose the ability to make the state Capitol a "gun free zone." Like other issues currently in the hands of the governor, that issue would also require legislative approval. The Legislature would also gain more power to hire private attorneys instead of relying on the Wisconsin Department of Justice for representation. In addition, lawmakers would gain the power to decide how to parcel out court settlements. Whether all of the plans will pass the full Legislature later Tuesday is unclear. Fitzgerald was not ready to rule anything out, but he wouldn't say whether he had enough votes to pass the changes to the presidential primary and early voting. Whatever passes the Legislature will need Gov. Scott Walker's approval. Speaking to reporters after an event at the executive residence in Maple Bluff on Monday afternoon, Walker was not ready to commit to the bills one way or another. "Members of the Legislature were elected, not on a term that ends on Election Day, but on a term that ends in January," Walker said. "Just like my term ends in January. And so we're going to look at things just like people expect us to serve a full four-year term." While this week's session is not the first time one party has used a lame duck session to its advantage, the nonpartisan Legislative Reference Bureau said this was the first time in state history that an extraordinary session had been used to restrict the power of an incoming governor and attorney general before they take office. "This is unprecedented, what is happening here," said Rep. Chris Taylor, D-Madison. Editor's note: This story was updated with additional reporting at 12:15 a.m. Tuesday Dec. 4, 2018. WPR reporter Shamane Mills contributed to this report.